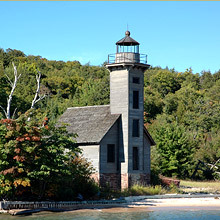 Pictured Rocks, Waterfalls, Lighthouses & So Much More! Munising, located on the shore of Lake Superior, was named for the Ojibwa Indian words "Kichi Minissing" which means "Place of the Island." 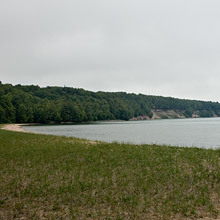 Known for the Pictured Rocks National Lakeshore, Grand Island, Alger Underwater Preserve and Hiawatha National Forest this area has become a 4-season vacation destination. Lake Superior is the largest freshwater lake in the world by surface area. Being 350 miles east/west and 160 miles north/south, Lake Superior covers 31,820 square miles. Superior Pontoon Boat Rentals is conveniently located in Munising Bay and is the perfect place to begin your day on the water. Let the scenery help you chart your course. 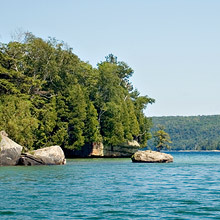 Grand Island is to the west and the Pictured Rocks to the east. You may want to try your hand at fishing. In Lake Superior you could catch Whitefish, Lake Trout, King Salmon, and Coho Salmon. For Pike, Bass and Panfish, try Murray Bay near Grand Island. The 70,000 acre park follows the south shore of the Lake Superior for 42 miles where Mineral-stained sandstone cliffs rise dramatically from Lake Superior near Munising to give way to wind sculpted dunes near Grand Marais. The awe inspiring cliffs are shaped by wind, ice and pounding waves. The cliffs are colored in shades of brown, tan, and green by iron, manganese, limonite and copper in the water. 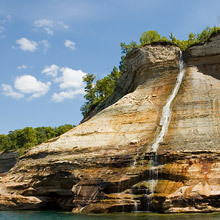 As the water trickles down the rocks or mountainous waves slam into the cliffs with a vicious suddenness, the sandstone Pictured Rocks are formed and changed. Some of the popular formations include: Miner's Castle, Battleship Row, Indian Head, Lover's Leap, the Color Caves, Rainbow Cave and Chapel Rock. 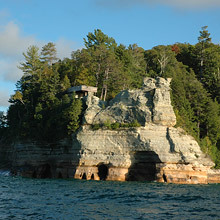 The best way to capture the glory of the lakeshore and rock formations is by boat. Go to www.nps.gov/piro for details. Grand Island, a Hiawatha National Forest National Recreation Area, showcases rich natural and cultural history. Grand Island�s lush beauty is obvious as you make your approach. The island's breathtaking overlooks, pristine sand beaches, and breathtaking views make this a perfect way to spend the day or afternoon. Travel to Murray Bay - a great place to throw in your anchor and wade to shore. Make sure to take time to spot the historic shipwreck, the Bermuda. Click to Book Your Trip Today!